i found no couples dancing at all. 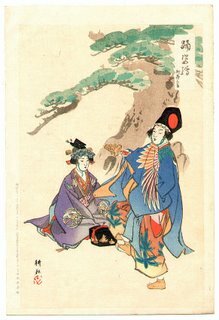 until the westerners came, there were plenty of spring painting prints, explicitly spring painting and perfectly matter-of-fact, the neighbor, maid, grandpa or child popping in to say this or that.... but no face-to-face dancing. and frightfully little group dancing. 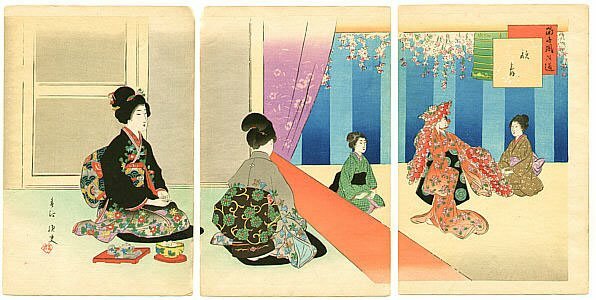 there are some images of a group of women doing a spring festival dance, but so few that i've been unable to find any online thus far. but there are single or paired dancers, men, or women.... and sometimes i can't tell which is which! they impersonate each other, and being a westerner i have not yet educated my eyes to tell the difference. 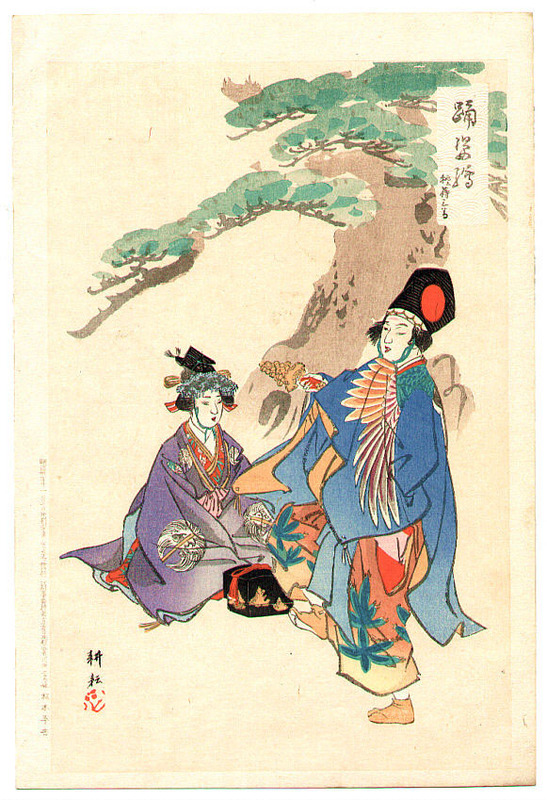 (though noh and kabuki were all men when the westerners arrived, they were mixed, centuries ago when they began. 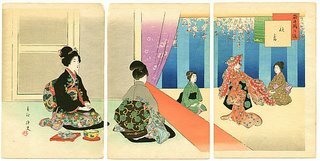 it seemed however that some women discovered courtesanry more profitable than theater, and eventually all women were banned.) 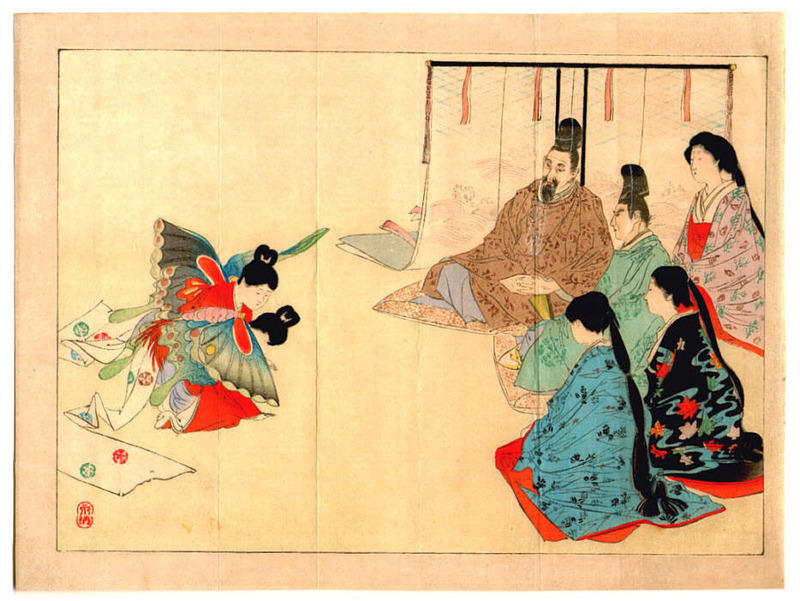 this is the butterfly dance; we'll be seeing that again soon. 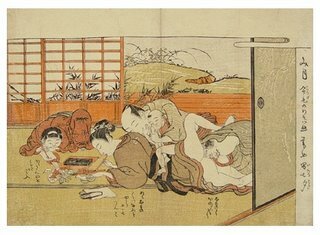 yes, there are huge theaters with kabuki and scores of people having dinner while they watch, but these three images really represent what i can find of dance--at least as we define it in the west. 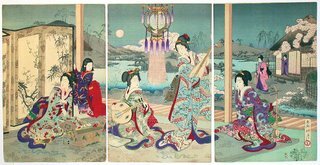 there are dances with spiritual connotations, but those are not generally for an audience. 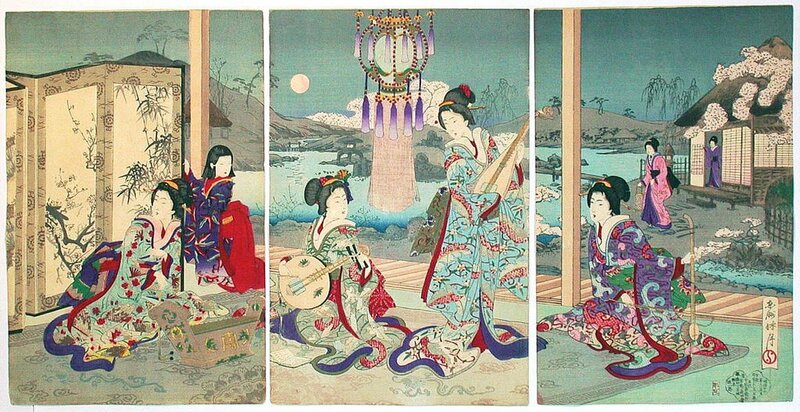 of course, ukiyo-e is the art of the floating world. 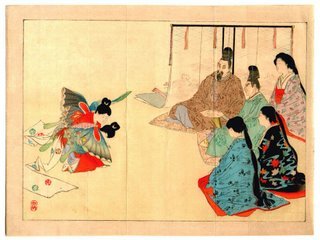 it's the art of the theater and the geisha and the courtesans and the butterfly dancers. some of the rules, restrictions, that came about when the west came in, sadly, slowed down production of the "green house" images. hi, and thanks so much for stopping by. i spend all too much time thinking my own thoughts about this stuff, so please tell me yours. i thrive on the exchange! which came first? woman or silly bad cat?